Rosin tech is a heat extraction method that, at the bare minimum, utilizes an ordinary household hair straightener (or any other flat heat press mechanism) to “press” out the terpene and cannabinoid-rich resin from the cured flower or hash. Rosin extraction is a simple mechanical process that has been around for several years and has recently gained traction. Rosin in its simplest definition is a solid form of resin that is obtained by adding pressure and heat to liquefy cannabinoids and volatile liquid terpenes. In recent years, the rosin technique has gained traction in the cannabis industry as it is a simple and affordable way to produce a quality cannabis product, within seconds. The rosin pressing technique separates the resin from the plant material by using heat and high pressure. Some patients and recreational consumers concerned with health issues are beginning to show a preference for concentrates made without potentially harmful solvents like butane and propane. Rosin extractions utilize processes involving heat and pressure and can be performed with a wide range of equipment, from bathroom hair straighteners and flat irons to industrial-grade laboratory gear. While flowers from cannabis strains range in THC potency from about 10%-30%, concentrates like rosin may be up to 80% THC or higher. You have probably heard about Butane Hash Oil (BHO) by now, so let’s take a look at the differences between BHO and Rosin. What is the Difference Between Butane Hash Oil (BHO) and Rosin? Rosin and BHO are both cannabis concentrates, but are each extracted differently. 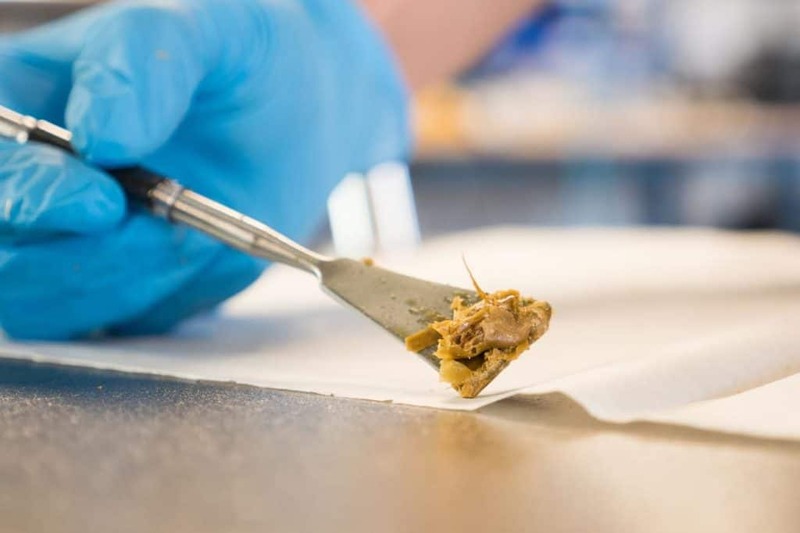 Rosin is the result of an extraction method that squeezes cannabinoids (THC, CBD) out of cannabis material using only heat and pressure, making it “solventless”. Rosin can be manipulated into popular consistencies, such as shatter, budder, wax, sugar, and so on, contrary to popular belief that shatter is exclusively made from BHO. BHO on the other hand is extracted by using butane, a harsh solvent, which strips cannabinoids from the cannabis material. The resulting oil requires extensive purging in vacuum oven chambers to remove the butane so that it is consumable. Many consumers are turning to the cleaner form of extractions so they know they are not smoking harmful chemicals when smoking their cannabis oil. Both Rosin and BHO offer comparable potencies that can range from 60-80% in active cannabinoids. What Factors Affect the Clarity of the End Product When Pressing Rosin? The most important factor affecting clarity when producing rosin is the quality of the material that is being pressed, whether it’s bubble hash, kief, or flower. For better or worse, what is considered “great” cannabis versus “average” is highly subjective and depends on what someone is looking for, and the factors that determine “quality” can be vastly different from person to person – but a few stand out. The better the starting material, the greater the resulting rosin will be in all measures, including clarity, yield, and effects upon consumption. Finally, the third key factor that contributes to clarity is the temperature at which the starting material is pressed at. Simply put, rosin that is exposed to high temperatures for too long tends to darken considerably and is subject to a loss of terpenes. Poor heat plate design and hot spots on rosin heat plates from cheap heating elements make for frustrating extracting experiences. There is legitimate scientific evidence that supports the notion of terpene loss at high temperatures, although different terpenes are damaged at different temperature levels. Additional tests have been performed on terpene degradation to oregano and basil leaves with similar results. The material and the equipment you use play a huge role in the temperature applied when pressing your rosin; even heat distribution and accurate heating are critical to reproducibility and making terrific, high-clarity rosin. What Is the Best Way To Make Rosin If I Want to Do it To Make Money in the Legal Cannabis Market? People at home often make low-budget rosin using a hair straightener and apply the heat to their flower. This can work for those on a extremely low-budget and not looking for the most amazing results in the end. For companies, or individuals who are serious about producing the best rosin, and turning a profit on their rosin sales, the best way to go is to invest in products from www.GoPurePressure.com. The highest quality rosin press sold in the commercial cannabis market is the Pikes Peak Rosin from PurePressure. The Pikes Peak rosin press that starts at only $5500, and many users find they make the money back almost immediately in the legal cannabis market, whether they are caregivers or a commercial operation. One of the biggest problems that people find is that many rosin presses utilize square heat plates and square rosin filter bags. This means material in the center of the filter bag has to travel a long distance to escape the filter. PurePressure’s 10” x 2” or 10” x 3” heat plates are specifically designed to reduce the distance rosin has to travel out of the filter. PurePressure’s rosin filter bags are 2” or 2.5” wide so as soon as the rosin is extracted it no longer sits on the heat plates, degrading the quality and value of your finished product. The Pikes Peak Press was engineered to provide years and years of reliability. The pneumatic cylinder requires no oiling or maintenance and through its unique design is able to achieve 5 tons of force with only 120 psi air. These extremely high forces ensure that all of your rosin is extracted efficiently. Ultra durable, powder-coated construction with a 1 year warranty. What can I extract from? You can press rosin from hash, kief, flower, and trim. What is the average percentage of yield one gets back? Typically, flower will yield between 15-25%. The higher quality you use the more yield you should get back. Kief and hash range from 30-60% and sometimes more. With trimmings your yield could be between 5-10%, or less. It’s really going to depend on the amount of trichomes on the plant matter. Higher quality inputs will always yield more rosin concentrate! Rosin vs BHO: What’s the difference? Rosin is pure, solvent-less oil extracted only with heat and pressure. BHO utilizes butane as a solvent to strip out cannabinoids. Then it still has to be vacuum purged to create usable oil. What’s the difference in rosin vs BHO THC%? With premium rosin and BHO the results have been known to be close to the same at around 80%. When pressing kief or hash, use a 36 micron or 72 micron bag. When you use flower, try a 115 or 90 micron bag instead. It’s very important to make sure you pack your rosin bags evenly and tightly with material. Make sure the material goes all the way to the seam. This will give you the best yield. When you use higher temperatures (210 – 220), this will produce rosin that has a shatter-like consistency. If you use lower temperatures (190-200), this will tend to produce a butter-like consistency. If your rosin is too sticky on the parchment to collect easily, set it aside or put it in a refrigerator to help make it more stable. When pressing kief or hash, turn the actuating speed down as slow as it will go and lower your pressure to make sure you don’t blow out your bag from all of the oil trying to escape. If you’re planning on turning trim into rosin, you’ll get a much better yield if you kief or sift the trim first, and then press the harvested kief/dry sift instead of just pressing the trim as-is. To order your Pikes Peak rosin press go to www.GoPurePressure.com.